The king of dogs, also known as Tazi’s or Baluchi Hounds the Afghan Hounds can weigh up to 50-60 Lbs and 25-27 inches in height. The females are just a slight bit smaller. They were the first found in Afghanistan, hence the name. This breed is very majestic and ancient. They are known for their speed. Afghan Hounds actually hunt by speed and sight and not by scent and were bred to track animals like deer and gazelles. They can reach a speed of 65 kilometres an hour. Like a race horse, it’s all in the hips. It is in their nature to chase what they see so a fenced in yard is recommended along with some monitoring. One hour of physical activity a day is required. This breed is a beautiful pet and it is the supermodel of dogs. 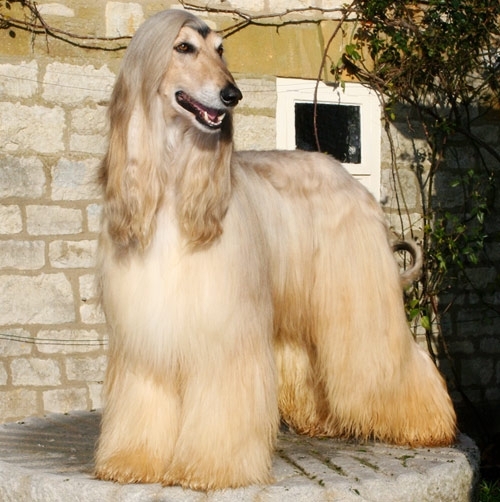 The breed’s long hair protects them and is also a signature look. Once a day brushing is needed as well as occasional grooming for less tangled mess. Like their hair, their noses are also long. Another signature look of this dog is the ringed tail that curls with a point. The shape of the tail does happen to get injured easily because it gets stuck in things, making them sensative to pain. These hounds are healthy and have a lifespan of 14 years. They are very kind dogs, aren’t very playful and enjoy calm environments and therefore get along best with older children. They are independent and can be described as cat like because of it. If you enjoy running and sharing your hair brush this may be the dog to welcome into your home.